Types of Insulation:- Ceramic Insulation, Mineral Insulation. 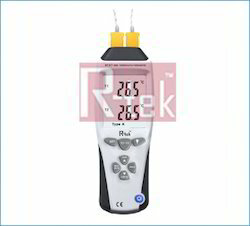 - Master meter is a professional Type K and Type J thermometer. - Microprocessor circuit assures maximum possible accuracy during the measurement. Backed with support of expert’s team, we are betrothed in providing a flawless series of Thermocouple Thermometer to the valuable patrons.